Working group set to report back this week on the scope of the planned Fourth IMO GHG Study. 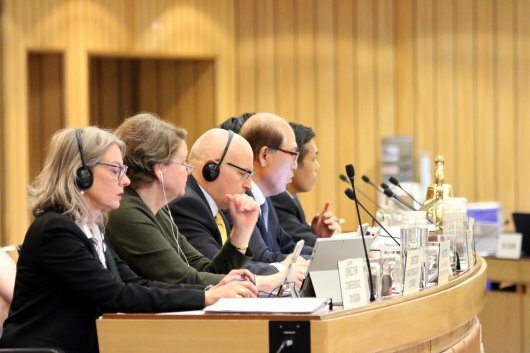 The work to deliver the International Maritime Organization's (IMO) Initial Strategy on reducing greenhouse gas emissions from ships has moved forward with the approval of a programme of follow-up actions. The IMO's Marine Environment Protection Committee (MEPC 73) approved the follow-up programme on Monday, October 22. It is intended to be used as a planning tool in meeting the timelines identified in the Initial Strategy, which was adopted in April 2018. The Initial Strategy refers to a range of candidate short-, mid- and long-term measures that will be considered by IMO. Short-term measures could be finalized and agreed between 2018 and 2023; mid-term measures, between 2023 and 2030; and long-term measures, beyond 2030. Feeding in to the process towards adoption of a revised Strategy in 2023 will be the data collection system on fuel oil consumption of ships over 5,000 gross tons, which begins on January 1, 2019; and a fourth IMO GHG study, to be initiated in the first half of 2019. The programme of follow-up actions provides agreed timelines for specified streams of activity. Commending the Committee's approval of the programme of follow-up actions, IMO Secretary-General, Kitack Lim, said the programme of follow up actions "sets a clear signal on how to further progress the matter of reduction of GHG emissions from ships up to 2023". "The planning exercise to implement the Initial Strategy up to 2023 is now behind us. It is time to take a step further. In looking at the agreed programme of follow-up actions, I understand that you have a heavy workload ahead," he said. "I am convinced that, in re-doubling your efforts and with enhanced support from working arrangements, you will be able to deliver and even accelerate the pace of actions and tackle this immense and global challenge." - follow-up actions towards the development of the revised Strategy - set to be adopted in 2023. The Committee invited concrete proposals on candidate short-term measures to the next Committee session, MEPC 74, in May 2019, for consideration, as well as on the procedure for assessing the impacts on states; and also on candidate mid/long-term measures to MEPC 74 and MEPC 75. A working group is set to meet during the current MEPC session, to discuss, in particular, the scope of the planned Fourth IMO GHG Study. The working group is expected to report back to the plenary session at the end of the week.